Artificial intelligence offers limitless potential for businesses to gain insights, maximize productivity and ensure informed decision making. If you’re ready to learn about what AI can do for you, JOLT is here to help! 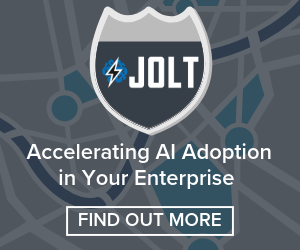 JOLT NYC will be one of the first events of its kind to focus on the adoption of Artificial Intelligence for business executives, taking place on January 23rd, 2019 at Park Central Hotel, New York.